Submitter: I stumbled upon this tome while browsing my local library branch. Now, as a craft beer drinker and writer about said subject, I already own several excellent books on alcoholic drink and its history and societal and cultural impact, both somewhat positive and somewhat critical. This book presented itself as exactly this kind of book in its cover blurbs, so I eagerly checked it out. Unfortunately, it turned out to be a classic “bait and switch”–it instead was somewhere between a history of alcoholism in the United States and a polemic attempting to frame America’s shortcomings and failures on alcoholism, all disguised as social history of alcoholic beverages. The author and her father were both AA participants. Submitter equates that fact to the idea that you’d also be distrustful of “a history of zoos written by a PETA member,” for example. The book claims that Ulysses S. Grant lost Civil War strategies due to his heavy drinking, that JFK was assassinated because Secret Service agents were hungover, that Nixon was a high-functioning drunk, that George W. Bush compulsively searched for Iraqi WMDs because of his past alcoholism. The book ignores noted Democratic scandals like “Ted Kennedy’s ill-fated drive at Chappaquiddick” (quote from submission). I’d probably weed it and add something on the same subject with better content. There are good current works available on alcoholic beverages and drinking culture in the United States. Don’t agonize over it. The publisher is listed as ‘Twelve’. Twelve Step Program perhaps? This leads me to believe that it is affiliated with AA. AA publications certainly deserve space in public collections but this one seems to be presenting itself as something it isn’t. I don’t know how it was classified but probably it was shelved with books on social history or food and drink. That’s the deceptive part. I worked in a special library dealing with the ancient world. We had our own classification system so we could keep ‘Chariots of the Gods’ classified and shelved as ‘Fringe Literature’. It would be nice if public libraries could do something similar. Twelve is an imprint of the Hachette Book Group. Amongst the authors it has published are Condaleezza Rice, Sebastian Junger, Christopher Hitchens, Peggy Noonan, and Barbara Ehrenreich. It is not affiliated with AA. Whether the book is historically accurate or not, I’m sick to death of living in a society that wants every non-Muslim person to get completely wasted every weekend or holiday. Attitudes about smoking has changed a lot over the years, but not alcohol. Even worse, if I choose to drink pop instead of alcohol I’m an obese, worthless loser rotting herself from the inside out. Never mind that alcoholic beverages are full of empty calories as well. it’s not funny. i enjoy wine but i never felt the need to giggle about it like i’m 15. This is a well received book by a well know literary author. Well worth keeping! Do a little research folks! A Million Little Pieces was well received too, until people found out it was 99% fiction. Should be weeded for the lies in it alone. Hmm. I don’t know if being in AA actively disqualifies anyone from writing about alcoholism—the submitter might be too defensive there. The submitter also ignores the fact that the author’s father is John Cheever, whose struggle with alcoholism is quite well known—I’d be shocked to see her writing a pro-drinking history. I also looked up the blurb. While the opening paragraph is indeed pretty vague about whether this is going to be seen through a pro- or anti-drinking lens, the second paragraph clearly states it’s “[s]een through the lens of alcoholism” which strongly suggests this isn’t going to be about some fun partying. It might be different on the physical book, though. Stephen Ambrose, the pop-history writer, had this problem. Academic historians identified numerous falsehoods and urban legends recounted as fact in some of his books, notably “Nothing Like It In the World” about the building of the Transcontinental Railroad, but no one paid attention until claims of repeated plagiarism were made shortly before his death. This wouldn’t be so bad, except that in many smaller libraries Ambrose’s books were among the only ones, if not THE only one, on the subjects of rail history, WW2 history, Eisenhower, etc. on the shelves! The argument for his inclusion is that his accounts, like those of other “pop history” writers like Simon Winchester, were compelling narratives by a good storyteller, while other, more accurate accounts were/are dry, stodgy, and dull by comparison. And library patrons want compelling reading over detailed accuracy. Also, I have a major problem with many libraries uncritically shelving books with idiotically preposterous propositions, and putting them in “nonfiction.” There is, of course, a vast difference between a book critically examining the phenomenal of UFOs and belief in flying saucers and aliens, and the likes of “Chariots of the Gods,” or any other book professing preposterously unprovable allegations as fact outside of Dewey 001.9. But on the other hand, where does this mentality end? Should librarians file books on astrology as “fiction”? (I think so, but….) Acupuncture? Clinton memoirs? (Don’t laugh–I saw an AAUW book sale where volunteers had prominently placed Reagan’s autobiography under “fantasy,” prompting attendees to put Clinton’s under “fiction”.) And there’s the circulation/popularity argument again: books that breathlessly speculate about the Bermuda Triangle, Bigfoot, the Loch Ness Monster, etc. sold a hundred times or more better than the few that skeptically and cynically showed the phenomena as hype that is easily debunked. The extreme of this debate, of course, would be the one over the thoroughly-disproven (at least from a scientific standpoint) allegations of the supposed link between vaccines and autism. Were I a librarian given this task, I would consider it my obligation to remove any books hyping this dangerous falsehood, yet I know it would bring about cries of “censorship!” from the disciples of this movement. Another extreme: I had a financial planner yank a book on financial-planning strategy and take it to the librarian and say, “You need to remove this book from circulation immediately, and any others by this author!” The librarian in charge attempted to diplomatically address the issue of not censoring, while the planner said, “Ma’am, I’m a certified financial planner and stockbroker….” She attempted to simply suggest that different strategies deserve to be seen, free press, etc., and then he said “Okay, how about this? Look that author up now. He’s just been sentenced to fifteen years in federal prison for tax evasion, tax fraud, and mail fraud–all using exactly the strategies he promotes in this book!!! !” At that point, they pulled it aside for review and went to find the other books by the author. 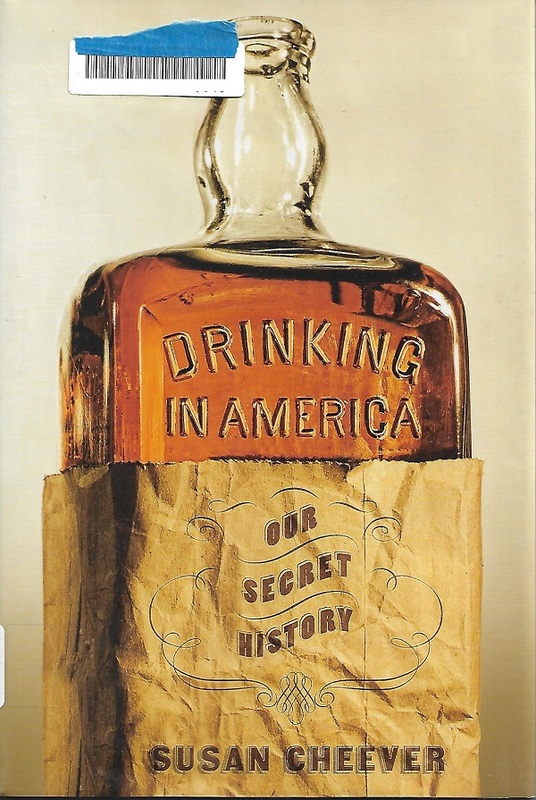 This site being “a collection of library holdings that we find amusing and/or questionable for libraries trying to maintain a current and relevant collection,” I find the inclusion of Drinking in America rather odd. I don’t recall seeing so recent a book (not three years old), nor one by so respected an author (a Guggenheim Fellow and National Book Circle Award nominee). Drinking in America itself received positive reviews in the pages of the Kirkus, Publishers Weekly, Vogue, the LA Review of Books, the Denver Post, and the Seattle Times and others. Again, this was not three years ago. The “bait and switch” referred to by the submitter may be in the eye of the beholder; I don’t see it. That the author and her father were “AA participants” is no secret; indeed, the participation of the latter is fairly the stuff of legend and is discussed in the book itself. Any bias is clearly stated. The sentence “Did you know the Pilgrims landed at Plymouth Rock because they ran out of beer?” does not appear in the book. The Pilgrims’ beer drinking is well documented. Ulysses S. Grant’s drinking is also well documented, as is that of the Secret Service agents tasked with protecting President Kennedy. The effect of alcohol on the Nixon presidency is not only accepted but is a subject of ongoing research. I’ve not yet read Cheever’s writing on George W. Bush’s alcoholism. Recognizing the submitter’s concern – “when books present blatantly misleading or demonstrably false accounts as ‘fact’ or ‘history’ it behooves librarians to question supplying them for reading, no matter how popular they may be or how much traffic they generate” – I wonder how it is that Drinking in America found a place on this site. Is it not current? Is it not relevant? Is a book that presents history in a false or misleading way to advance an agenda an “Awful Library Book”? Ditto one that presents quackery, superstition, or falsified “science” (like the claims of a link between vaccines and autism) as fact? Is putting such books in the collection participating in the “dumbing down” of society so decried by others? I, for one, have a serious problem with a public library carrying such books, at least now without quantifying such books as falsehoods or faith-based, depending upon context. The exact sentence may not appear in the book, but Cheever does assert that proposition of the Pilgrims landing because they ran out of beer as fact–a proposition debunked by serious historians as based solely on one cavalier journal entry. But, as we say, “never let the facts get in the way of a good story!” And the section on the JFK assassination (supposedly because of hung-over SS agents) descends into Oliver-Stone-like levels of delusional conspiracy theory. Yes, I’m going to call “highly questionable” books like those “Awful Library Books.” They’re not all just forgotten shelf orphans, after all. I’m happy to respond. You ask whether a book that presents history in a false or misleading way to advance an agenda is an “Awful Library Book.” This is, I think, a question best answered by our hostesses. That said, I don’t see that such a book is necessarily “questionable for libraries trying to maintain a current and relevant collection,” which appears to be the criteria. I note, for example, that copies of Ann Coulter’s books held in libraries throughout the United States. Susan Cheever does not assert that the Pilgrims landed because they ran out of beer, rather she writes that a dwindling supply played a part. This stance has not been debunked by serious historians and is perhaps most notably supported by National Book Award-winner Nathaniel Philbrick in his Mayflower: A Story of Courage, Community and War (Viking, 2006), a finalist for the Pulitzer Prize for History. Cheever’s speculation that documented early morning drinking by members of the Secret Service on the day of John F. Kennedy’s assassination may have clouded their judgement and slowed reaction times is hardly the stuff of delusional conspiracy theory. I’m curious what agenda you believe Susan Cheever is attempting to advance. Booze is evil and has made evil things happen throughout American history, such as the assassination of Kennedy and the mess of Nixon. I have no problem with someone advancing an agenda such as this. I just ask that you don’t attempt to present your polemic as a serious, or even “pop,” history book when you do so. For the record, I would have just as much of a problem with any book presenting supposed history of any sort in a biased and prejudicial fashion–such as Rush Limbaugh’s children’s book series on American Revolution history, or various “recastings” of history advancing the idea that some race or ethnic group “saved civilization,” as another pop-history theme exploited several times–being presented as serious history as well. Or, for that matter, a book promoting atheism being marketed as a history of the Bible and cataloged among books on Christianity. Live by the sound bite, die by the sound bite. As librarians, we have a duty to make information available. Some of the content of that information will not be approved by every patron. We do not set ourselves up to decide for them what is “true” or valuable, that would be censorship. Instead, we make the information available so that they can make that judgment for themselves. We also do not cast judgment upon authors by deciding that their works are “fiction” or “fringe materials.” This is also a form a censorship. The submitter has, in essence, submitted a book challenge, and requested this site to endorse his or her plea for censorship. Submitter needs to understand that there will be books they disagree with at their library. Even the inclusion of this book on a site called “Awful Library Books” is a blow against intellectual freedom. I have added this book to my library’s collection as a result of this post. This is hard one for me, as I haven’t actually read this book. I think one thing we have to remember is that most of us purchase for our collections from catalogs and reviews. I know of no librarian who has read every book in their collection, or would be able to in a lifetime. I agree that librarians should provide accurate information, as possible, but there is not promise on the doors of every library that every book within is perfectly accurate on every subject nor could there be. So, I think if this is kept or removed has to do with the individual libraries assessment of the accuracy of the content and their community. I’d also like to add that the idea that history books are every perfectly accurate and contain only facts is false. History is full of bias, complexity and interpretation. That’s what makes it interesting. As a historian, I’m perfectly willing to concede that there is no such thing as perfect accuracy or history recounting. As a libertarian, I am also respectful of freedom of the press and the freedom of the marketplace of ideas. But I have an issue with falsehoods presented as fact, plus their presence in a library (public or academic) as symbolic “endorsement” of said charlatanry. It’s on this basis that I believe that “balderdash” books don’t belong in a public library–books such as the one my financial planner ID’ed as promoting strategies likely to get someone imprisoned. This book doesn’t necessarily rise to this level. But it still irritates me on the grounds of “false advertising” and questionable scholarship. But having said that, I’m curious to see what whacked-out Kennedy assassination conspiracy tomes are on the shelves of my regional library network now…….. since it was the “Kennedy got assassinated because Secret Service agents were hung over” proposition/implication that was the “final straw” for me in this book. I fully understand and agree. But I can also rattle off any number of instances where the “industry” and advance reviews of a popularly-promoted book were (of course) glowing and enthusiastic, and the subsequent reviews by Amazon readers and/or academics were critical or negative. In fact, go look over the Amazon reviews for this very book: Most of the “five-star” reviews seem to have been either written by the publisher’s PR hacks or are comments on the speed of Amazon’s fulfillment, while the reviews by people who allege to have read the book are largely negative. I don’t have a good answer to this dilemma. Libraries have to serve a public that is just as susceptible to hype and salesmanship as anyone else. But I’m sure there have been many cases of “buyer’s remorse” out there on library shelves. As the wife, sister-in-law, aunt, and granddaughter of alcoholics, I find this whole discussion ridiculous. Virtually every book I’ve ever read (probably close to 10,000 at this point) has had errors of some kind in it. So, should we throw away the rest of the book with the error page? No. Critical thinking skills are what we need, and by reading lots of different books, that’s what we learn. However, I’m not going to spend a week writing screeds of self-defense in my viewpoint. Instead, I’m going to check out my library’s copy of this book, which will ensure it continues to have space on the shelf for another couple of years, and read it while drinking a nice glass of Malbec. Ta!